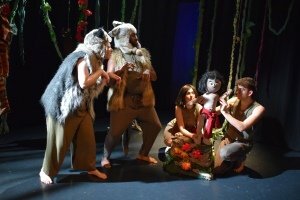 The Jungle Book at Streatham Space Project is the story of Mowgli, a little boy who was raised by wolves in the jungle and faced the fearsome man-eating tiger, Shere Khan. This story was told by a small cast of only four. Shere Khan played by Jordan Laidley, Mowgli played by Kayleigh Barnes, Bagheera played by Jonathon Hands and Baloo played by Hannah Harris. They worked well as a team. On top of their main roles, they played extra characters like a hissing snake and monkeys. Their energised storytelling had the children captured from the very beginning. The set was a beautiful representation of the jungle. There were green plain and sparkly ropes representing greenage, there were flowers and trees too. And hidden within the jungle were hooks, where costumes were strategically placed allowing for cast members to quickly be transformed into another character. The costumes were fun, a furry striped coat with tail representing the tiger, green sparkly eyes with brown ears and a brown tail for the monkeys. All very appropriate for the very young audience. There was poetry that captured the audience’s attention. The fun music, beats and drumming had the audience swaying in their seats. The children weren’t shy to join in with the singing, bum-wiggling, dancing or even the shout outs. There were lots of children who had the giggles in the audience. The Jungle Book at Streatham Space Project is a fun show! It is described as a modern re-telling of Rudyard Kipling’s classic tale, and it certainly lives up to that description. It was full of different types of audience engagement that the children loved and fully embraced. My seven-year-old boy enjoyed it thoroughly and I am sure some older children would enjoy it too. And of course, there was the opportunity at the end of the show for the children to meet the cast, ask a few questions and take photos, personalising and making it special to each individual child. A lot of effort and thinking has gone into this production and it has paid off. This is one of those shows that is really worth taking your young children to watch. A new adaptation of Rudyard Kipling’s Mowgli stories. Learning the jungle law with Baloo the brown bear and Bagheera the black panther, Mowgli finally grows strong and brave enough to challenge his stripy enemy, Shere Khan.